The indicator shows the annual quantity of waste exported from and imported to Slovenia, which can be either hazardous or non-hazardous and which requires consent. Transboundary shipping of waste is governed by Basel Convention on the Control of Transboundary Movements of Hazardous Wastes and Their Disposal (Official Gazette of the Republic of Slovenia - IA, no. 15/93, 2/00 and 23/2004) and the Regulation (EC) No. 1013/2006 on shipments of waste (OJ L No. 190/2006). The latter implements the Basel convention, the resolution of OECD Council on transboundary movement of waste and the Lomé convention. Import of waste into Slovenia for the purpose of deposit it into or onto land is prohibited. It is only allowed if waste is disposed of in some other manner or recovered and if the technical capacities allow it. Export of waste from Slovenia is allowed only if technical capacities and plants necessary for harmless disposal of waste are non-existent or not sufficient on the territory of the Republic of Slovenia and if export is not in conflict with the provisions of the Regulation (EC) No. 1013/2006. To ensure final disposal and recovery of hazardous waste, and to use the infrastructure within the EU when national facilities are not sufficient or non-existent (Resolution on National Environmental Action Plan 2005-2012. The quantities of imported waste in the last years have fluctuated between 20,000 and 25,000 tonnes per year. Since the majority of imported waste is processed by one processor, the quantity of imported waste depends on the quantity of waste collected within Slovenia. In 2006, waste lead-acid accumulators, their parts and lead ash were imported from Croatia, Hungary, Bosnia and Herzegovina, Serbia and Macedonia for recovery in MPI-Reciklaža d.o.o.. In the past years, several acidic and alkaline solutions have been imported in order to be recovered in Cinkarna Celje. 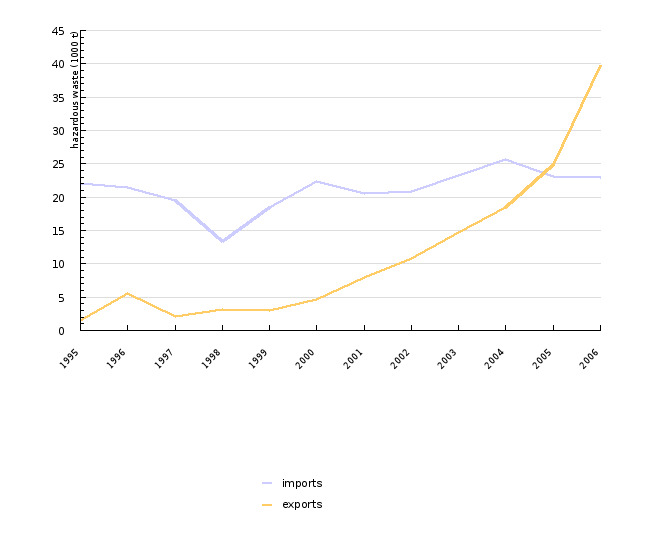 Export of waste has been increasing in the last years; in fact, in 2006, it was almost doubled. This increase is a result of the increased volume of sludge from urban wastewater treatment plants. In 2005, this type of waste represented 7% of the exported waste, and in 2006, 36%. In 2006, solid waste from gas treatment (14%), washing liquids and mother liquors (12%), sludges from paint or varnish containing organic solvents (15%), partially stabilised waste and other types of waste were exported. The waste was disposed of or recovered in Austria (77%) and Germany (20%), and part of it also in France and Poland. According to a study carried out by the European Topic Centre on Waste and Material Flow, transboundary movement of waste over the borders of EU countries has increased dramatically in the last decade. This increase is a result of transporting hazardous and non-hazardous waste, as well as illegal transports. In 2003, 8.6 million tonnes of hazardous and non-hazardous waste crossed the borders of EU countries. Over 90% of this waste was transported within the EU. Around 80% of it was recovered and 20% was disposed of. The data have been collected based on the legislation in force, namely the Basel Convention on the Control of Transboundary Movements of Hazardous Wastes and Their Disposal (Official Gazette of the Republic of Slovenia - IA, nos. 15/93, 2/00 and 23/04), and the EU legislation. The EU legislation changed significantly in 2006. Regulation (EC) No. 259/93 was replaced by the Regulation (EC) No. 1013/2006, which came into force in the middle of 2007. The Commission Regulation (EC) No. 1418/2007 regarding the export for recovery of certain waste from Annex III or IIIA to the Regulation (EC) No. 1013/2006 of the European Parliament and Council in the countries for which the OECD Decision on the control of transboundary movements of waste does not apply came into force. Wastes that require the acquisition of consent for import and export are, according to the Act on Ratification of the Basel Convention on the Control of Transboundary Movements of Hazardous Wastes and Their Disposal (Official Gazette of the Republic of Slovenia - IA, nos. 15/93, 2/00 and 23/04): waste materials belonging to any category listed in Annex I to the Basel convention, unless they do not possess any of the characteristics listed in Annex III of the Basel Convention (no hazardous characteristics), but are considered as hazardous according to the national legislation of the country of export, import or transit. According to the Basel Convention and the provisions listed in Regulation (EC) No. 1013/2006, this category also includes wastes that do not possess any hazardous characteristics, but a consent is required for transboundary movement, for example if a country requires intensified surveillance of shipments of paper, glass, tyres and similar materials. A plant performing recovery/disposal of wastes in the country of import for which it has obtained all the necessary permits for import, transit or export, must submit the certificate on the disposal/recovery of waste to the Environmental Agency of the Republic of Slovenia, the competent authorities in the country of import and transit, and to the sender, no later than within a year (in case of final operations) or within two years (in case of intermediate recovery/disposal operations) after receiving the shipment of waste. The certificate lists the date of transport, shipping and receipt of waste by the processor/disposer of waste and the date of disposal/recovery of this waste and the quantity of transported shipped, received, processed/disposed of waste. The data from transport documents on the disposal/recovery of waste are entered into the Transboundary movement of waste database, which also includes all the issued consents. Based on this data, the record on actual quantities of imported and exported waste is kept for individual issued consents and for reporting to the Secretariat of the Basel Convention in accordance with Articles 13 and 16 of Basle Convention and to the European Commission in accordance with Article 51 of the Regulation (ES) No. 1013/2006. The data on transboundary movement of waste obtained this way are reliable and accurate.